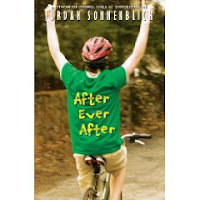 After Ever After by Jordan Sonnenblick. Grades 4-8. Scholastic, February 2010. Review copy provided by publisher. We first met Jeffrey in Drums, Girls, and Dangerous Pie, narrated by Jeffrey's older brother Steven. Then Jeffrey was a little kid with cancer. Now, he's a teenager in remission. That's great, right? He survived, he beat the cancer. But what he found out is that after you beat the cancer, you still have to deal with it. He's slower in school because the chemo affected his brain. He walks with a limp because the chemicals caused nerve damage in his foot. And he'll always, always be The Kid Who Had Cancer. Which is why it's so interesting when there's a new girl from California in his class. Lindsey doesn't know him as the miracle boy who survived a horrible illness. And let me tell you, if Jeffrey could figure out how to ask her out, that would be the true miracle. If only his trusty big brother was around to help him, but Steven's escaped to Africa to join a drum circle, leaving Jeffrey to fend for himself. Add to the mix the standardized tests that all the eighth graders have to pass in order to move on to high school. The test that Jeffrey's sure he's going to fail. Yeah, Jeffrey beat the cancer and lived happily ever after. But this book is about what goes on after ever after. Oh, you guys. You knew I was going to love this book. I love me some Jordan Sonnenblick. Drums, Girls, and Dangerous Pie was a winner of the Illinois kids' choice award (the Rebecca Caudill Young Readers' Book Award), after all. And of course I loved this book. It made me laugh and it made me cry, which is exactly what I have come to expect from Jordan Sonnenblick*. In Drums, Girls, and Dangerous Pie, who knew that a book about cancer could actually be funny? Well, After Ever After is funny, too. And touching. And my favorite thing is that while cancer does play a prominent role in setting up the story and how things play out, the book is really just about an eighth grade kid who happens to be a cancer survivor. He faces the same difficulties that any eighth** grade boy might face. He likes a girl. He has a best friend who can be a jerk sometimes. He's facing a major test and feeling a lot of pressure. And boy howdy, Mr. Sonnenblick's stance on standardized testing is NO SECRET in this book. That's all I shall say about it. So, yes, the book made me laugh. And it had characters that I cared about and was interested in. And can I just mention that I love the way the cover (at least the ARC cover) matches perfectly with DGADP's paperback cover? In fact, if you haven't already read DGADP, I insist that you do so. And you have a little bit of time because After Ever After is due on shelves February 1. *Except for that Dodger and Me series. I just couldn't quite get on board with a blue chimp. ** Is it just me or is "eighth", like, the hardest word to spell? I don't think I've spelled it right on the first try one time in this entire post. Arg. This looks like a great book! Would you recommend for a third grader? Oh, dang. I was hoping this was a Cybils book... putting Drums, Girls and Dangerous Pie on my TBR list, though. Daisy - I think the subject matter might be a little mature for a third grader, but of course that would depend on the individual kid! Melissa - I know, right?! Next year it will be...! Pluto never stopped being a planet, and the writers of these books should not blindly accept the controversial IAU demotion. Only four percent of the IAU voted on the controversial demotion, and most are not planetary scientists. Their decision was immediately opposed in a formal petition by hundreds of professional astronomers led by Dr. Alan Stern, Principal Investigator of NASA’s New Horizons mission to Pluto. One reason the IAU definition makes no sense is it says dwarf planets are not planets at all! That is like saying a grizzly bear is not a bear, and it is inconsistent with the use of the term “dwarf” in astronomy, where dwarf stars are still stars, and dwarf galaxies are still galaxies. Also, the IAU definition classifies objects solely by where they are while ignoring what they are. If Earth were in Pluto’s orbit, according to the IAU definition, it would not be a planet either. A definition that takes the same object and makes it a planet in one location and not a planet in another is essentially useless. Pluto is a planet because it is spherical, meaning it is large enough to be pulled into a round shape by its own gravity--a state known as hydrostatic equilibrium and characteristic of planets, not of shapeless asteroids held together by chemical bonds. These reasons are why many astronomers, lay people, and educators are either ignoring the demotion entirely or working to get it overturned. I think I would like to read After Ever After. Most books about cancer talk about getting through it and surviving- none seem to address the aftermath. It looks interesting. This one is high up on my TBR list, too, Abby. I adored Drums, Girls and Dangerous Pie. I actually like the Dodger books, too, but they are very different. Anyway, thanks for the review. Glad that this one lives up to DGDP. I can't wait to read this. DGADP is one of my all-time favorites so I already know I will love this one. Abby, as a librarian, would you recommend this for an elementary library? Some of my 5th graders who loved DGDP have been asking for it. Some reviews put it at 10+, while others say YA. I've read it and I'm okay with it, but I need a 2nd opinion. Thanks!